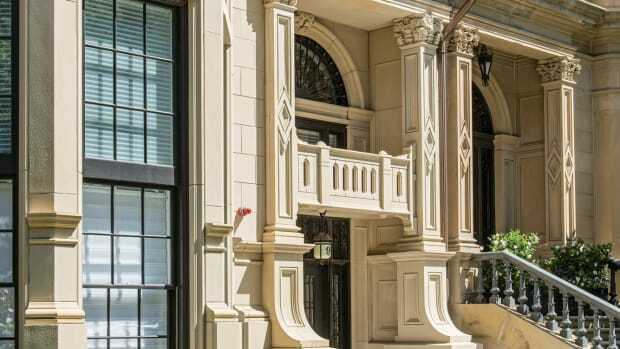 A Philadelphia townhouse is reinvented with a French inspiration. 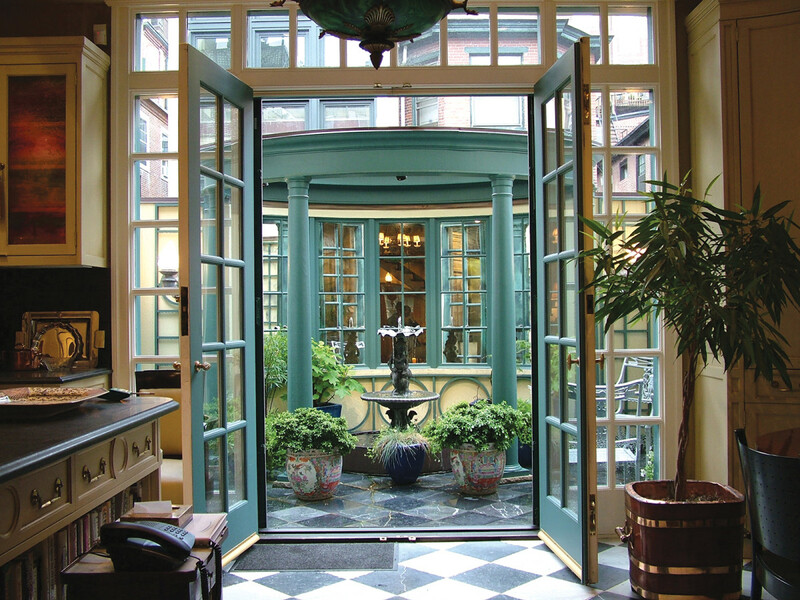 West Chester, PA-based Archer & Buchanan Architecture was hired to renovate this townhouse in Philadelphia, PA – the exterior was in good shape, but the interior was badly in need of natural light and better circulation. Philadelphia, PA, is home to many brick, four-story townhouses, realizing William Penn’s ideal city plan. One such house, built in the Rittenhouse Square neighborhood in 1854, was recently renovated by West Chester, PA-based Archer & Buchanan Architecture, Ltd.
Before the renovation took place, rooms on the first floor were small and not well lit. A stair in the middle of the plan broke up the space, standing between the living room and kitchen, and blocking access and flow from the front to the back of the home. 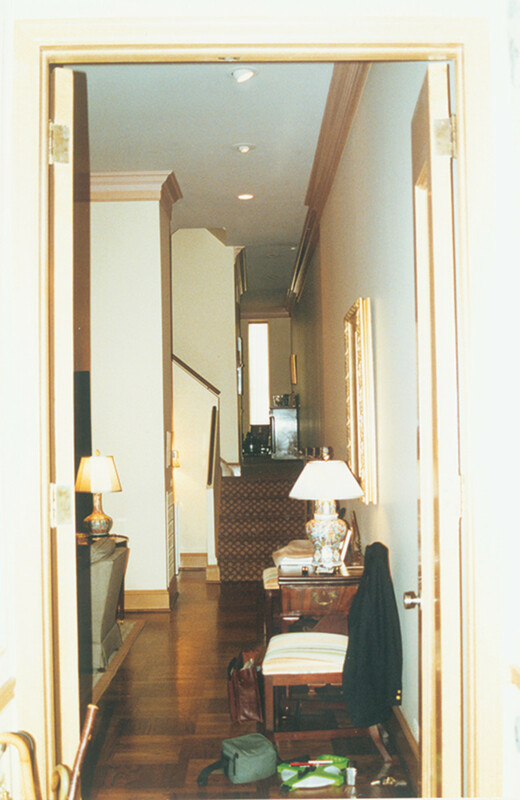 The interior of the townhouse was dark and featured small, boxy rooms on the first floor, which the owners rarely used. Instead, they lived mainly in the basement, site of their kitchen and living rooms, and on the upper bedroom floors. The goal of the renovation was to bring natural light into the interior, and open it up. “How do you make a series of boxes and dark rooms in an existing townhouse open, flowing and functional, while the house is occupied and the exterior structure remains the same?” asks Peter Archer, AIA, partner with the architectural firm. The answer in this case was to gut the entire 18-ft.-wide first floor, while including a temporary stair so that the owners could use both the lower and upper levels while the work was being done (except for a week or two while the new stair was being installed and the owners were relegated to a hotel). At the rear of the house, a wall was opened up and large glass doors with sidelites and transom windows were installed, filling the originally windowless space with natural light. This allowed for a 16x9-ft. garden terrace with a fountain to be cantilevered off the back of the house, creating an outdoor room that is used in the spring and fall. 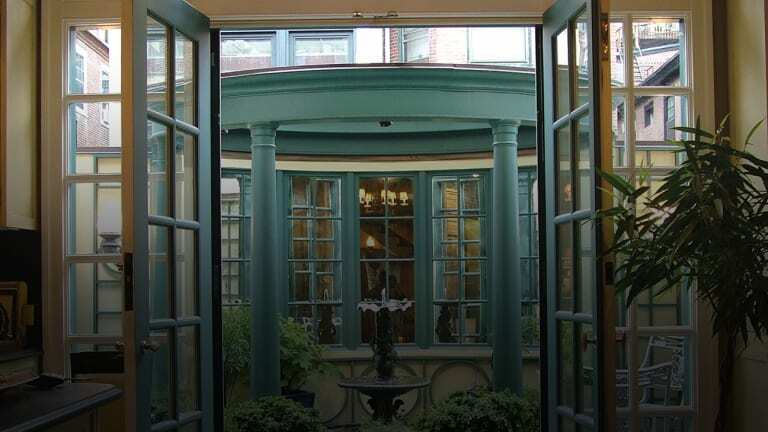 As the alley behind the townhouse was not very attractive, a wall-and-mirrored-glass “pavilion” was designed to create a small and private garden terrace that was cantilevered off the back of the house. The abbreviated L-shaped floor plan is that of a typical Philadelphia townhouse. “The idea in the planning of these townhouses was that the L shape of each neighboring house was reversed, thus creating light wells that allow light into a side of each house,” explains Archer. In this case, the neighbor had already filled in this space, so the architects took that route with this house as well. “It was a one-story infill, so we added a skylight for more natural light for the stair hall and kitchen,” he says. The sinuous curve of the new stair winds from floor to floor, expressing the connection in a sculptural fashion. The new wood staircase, which connects the living room and dining/kitchen area, is “a sculptural piece,” says Archer. “We worked with the change of floor levels to create a flow among the rooms.” The center structure of the first floor was changed so that the stair, which has iron railings, now winds around and down to the lower level, but isn’t a continuous curve. “We took out the original stair, which originally stood between the living room and kitchen, blocking access and flow from the front to the back of the home, and created a new configuration in order to connect all the floor levels. The new stair flows into each space, and its curves and the ceilings help to mold the space,” he says. The checkerboard pattern of the tumbled marble flooring carries the eye from one room through to the next. 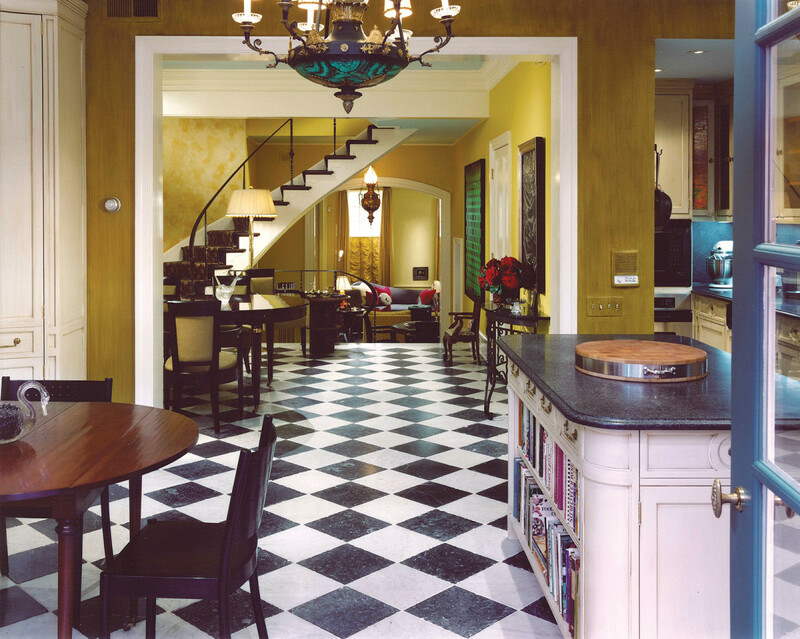 Tumbled marble in a black-and-white checkerboard pattern was used for the flooring from the top of the stair to the dining room, to the kitchen and to the garden terrace, as a “throwback from the early-20th century,” he adds. An elevator provides access from the garage on the lower level to the first and second floors. The circulation from room to room was important, as the architects were confined by the width of the building, as well as the existing ceiling heights. “We worked within those confines to design well-proportioned rooms with continuity from one to the next,” says Archer. The open plan allows for daily activities to take place comfortably in the most spacious parts of the home, like the living room. 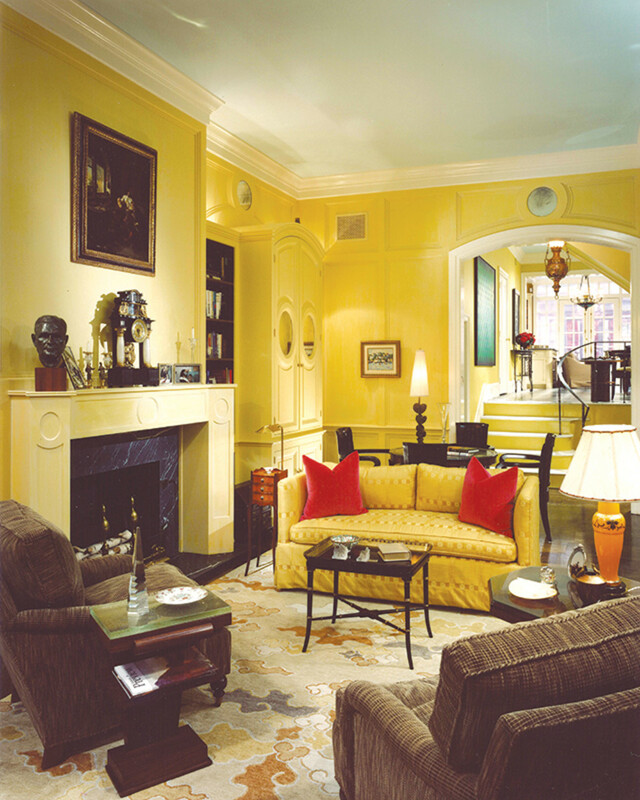 The architects worked closely with the decorator, Vincent Smith-Durham of Embreeville, PA, in choosing striking yellows and greens to paint the interior, which were meant to “create a vibrancy that takes natural light and creates a very brightened and cheerful room,” explains Archer. The living room features paneled and painted millwork inspired by the Louis XIV tradition, although it wasn’t meant to be an exact replica. The built-in casework, with cabinets and circular mirrors, flank the fireplace, and “give the appearance of pieces of furniture,” says Archer. “They hide a television and a dry bar, so the room functions comfortably as a formal living room, but can also be used everyday as a family and television room.” The living room floor is oak, which was stained very dark, almost black. The trim throughout was painted with five coats of high-gloss paint and the ceilings are plaster. All the fabrics and furnishings were designed or selected by Smith-Durham. The cabinetry work features a high level of detail and craftsmanship. Closet doors have old mirrors made of smoked glass fixed into the millwork to “create an illusion of space and historical precedence,” explains Archer. 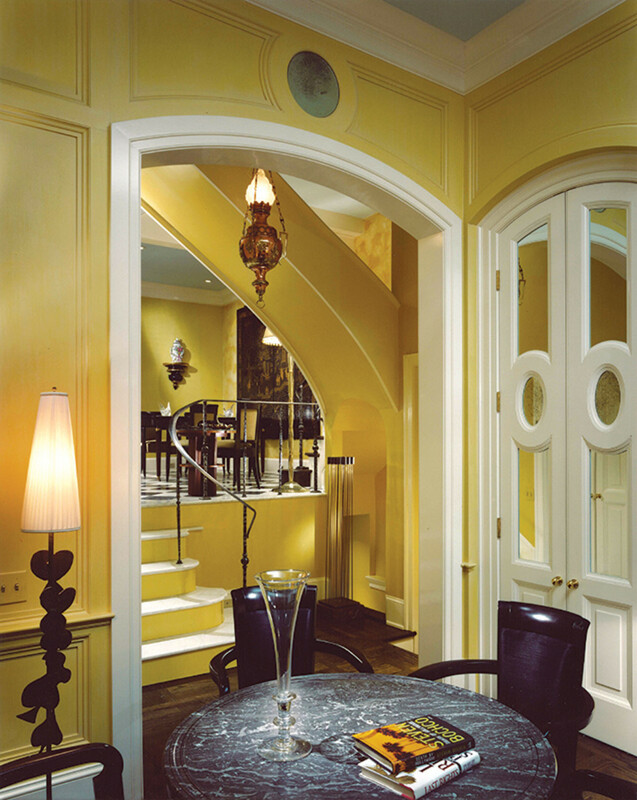 The cabinetry was done by Victor Rossi of Philadelphia-based Rossi Brothers. 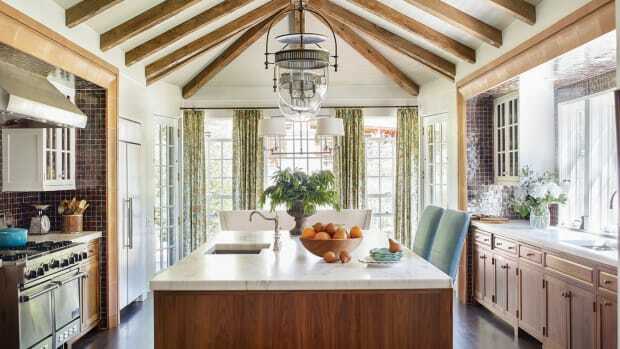 Lighting was carefully placed so that the need for ceiling fixtures was minimized. “The lighting – lamps and antique fixtures – was designed to highlight the architecture of the rooms,” says Archer. For instance, puck lights were placed at the top of the cabinetry to highlight the moldings. The kitchen also features custom-made, painted poplar cabinetry. The chairs for the dining room all came from the French ocean liner Liberté, which was retired in 1958 and scrapped. The chairs, now refinished, were made ca. 1948, and are stamped on the bottom “Oau Bucheron, 10 Rue de Rivoli, Paris”. The client acquired them in 1980 from the Sagamore Resort on Lake George in the Adirondacks. 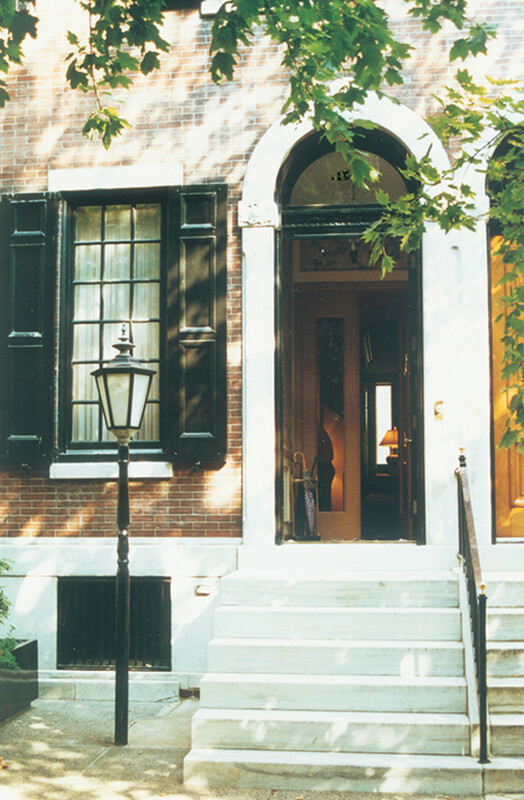 Meyer & Meyer recaptures the spirit of the original design on this beautiful Back Bay townhouse in Boston.